Take advantage of our new drywall installation services that are designed to give you the best walls and ceilings in the shortest possible time. We work with dexterity and precision to make everything absolutely perfect and to ensure that you will enjoy the safest and most comfortable setting for a long time to come. Our expert team consists of draftsmen, installation technicians and customer support specialists who will do all it takes to deliver a service of the highest quality. 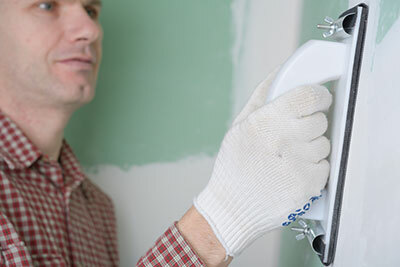 We have long-term experience and extensive expertise in drywall repair, addition and remodeling. That is why we work on installation projects of various sizes and complexity. We are excellently facilitated and have a sufficiently large number of people to do the job excellently and to produce the required outcome right on time. We provide both residential and commercial drywall services. We can give the perfect interior to any house or commercial building. When you come to us, we will work closely with you to get complete understanding of your specific needs and requirements. Our job is to turn your plans into reality and we do it excellently. Once we know exactly what you want, we will produce the office or home drywall addition blueprints. Our experienced drafting specialists deliver blueprints of the highest quality regardless of the complexity of the job which has to be done. We use a detailed drywall construction schedule to ensure that we will complete the work in the shortest possible time. We have flawless organization. Our technicians are perfectly mobile and highly flexible. We have all the materials which are required for the job in stock. We are fully facilitated to perform all of the necessary tasks. You can rest assured that we will stay right on track throughout the entire course of the project and that we will keep the set deadline precisely. We, at "Drywall Repair East Los Angeles", use our specialist skills and the most effective techniques for installation. We achieve flawless fastening and seams. We create corners with perfectly straight edges. The wall and ceiling surface is absolutely even and smooth. The structures which we create are strong and durable. You can expect them to remain in excellent condition without any kind of specific maintenance. We are fully prepared to add any type of finish to the interior walls and ceilings which we have created. You just need to decide how you want the interior to look. We are experts in installing wallpaper, fabric, vinyl and even wood wall coverings. We can give you the perfect brick walls as well. We will provide professional advice to help you make the ideal choice. Check out the great deals which we offer and update constantly to meet and exceed the expectations of customers.